"WHO" is visiting Fur Shui? This is a very wise owl! 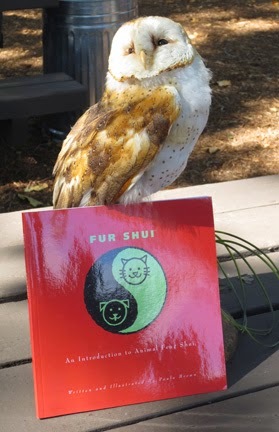 Fur Shui visited a nature class; "Painting Birds at the IRC" for kids of all ages. From barn owls to beautiful Acorn Woodpeckers...folks had an opportunity to "do art" from the Irvine Ranch Conservancy bird mounts. The owl's white face and breast reflect the Creative Life Style gua or life space that holds the energy for creativity and children. Go to this section of your home to amp up that delightful quality of childlike imagination, creativity and fun for all ages. Let your creativity come forth bay a little addition of the color white and the element of metal to forge those new imaginative discoveries. Let your imagination soar with a little Feng Shui!